This is the first complete day in Bangkok, so we’re going to visit the Grand Palace’s area this day. As this is two days before King’s birthday we will pay attention to the events can be performed there, as the “Troop of colors”, a parade which could be this day and alter our agenda to watching it. We would take a taxi from the last spot, the Monument, to our hotel. ;I knew last night the popular troop of colors is not today, it was yesterday: December 2nd; so we can follow the original plan of visiting Bangkok’s highlights. The first thing to do is taking our breakfast and, when I see the buffet ready for it I get one of the greatest thrills of this travel: everything you can breakfast is in here. It would even be a great buffet for lunching. I try to taste as most as possible, and that includes cereals, pad thai, soup, eggs, meat, juices, pasta, fruit, salads, … When we leave the place there is more percentage of food in my body than human being. We need to exchange the rest of the cash for this travel and I looked previously for the best place for it. Best rates are in SuperRich and there is one office after two Skytrain stops. That’s our first visit. 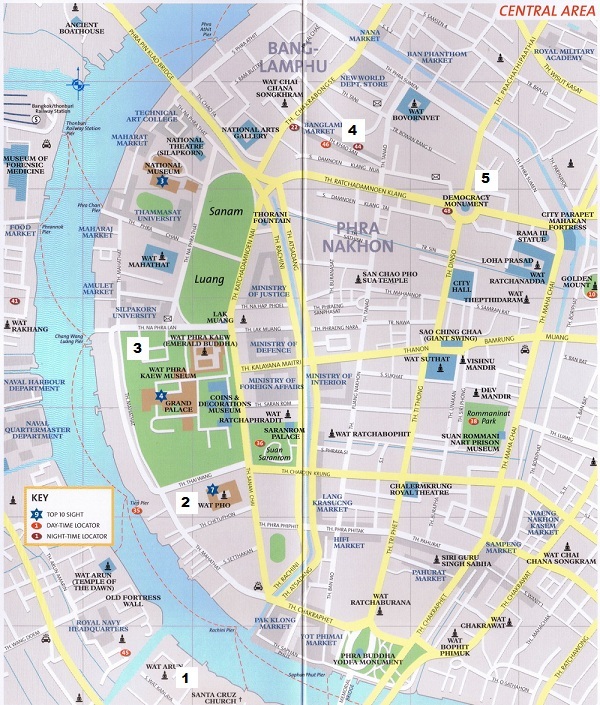 It is not easy for us to find the office on despite of the map printed from their website, but Bangkok is full of alleys, apart from the streets, which get to confusion some times. Once with the Bahts, we go back to the Skytrain to get to the river, but first we pass by the Erawan temple nearby. We just see there a small altar and some local dance. We go up to Ratchambutri station from where we can get a higher look of the area, with a huge hippodrome which has got a golf field in the middle. We’ve got a lot of pictures of the Christmas decorations around during our walk. It is curious seeing balls, snowed trees, reindeers, etc… wearing shorts on the middle of this heat. When we reach the river at the end of the Skytrain line we just follow the rest of tourists because all of us are going to the same place: the pier. We take Chao Praya Express for going to the area we’re going to visit today by 30 Bahts, which are not paid in advance, but once sailing by the river. We leave it at Wat Pho stop, the temple we’ll visit later, but we still must take another boat to go across the river where we’ve been watching Wat Arun shape some minutes before. It only costs 3 Bahts per person. This is the only visit on the occidental riverside and our approach to it corresponds to the picture used as header for these pages. When reaching the temple we’re meeting houses with the typical local architecture and huge statues of warriors, as Colossi. We find a couple of cardboard stand ups as the typical dancers with a hole to put your face on. I ask Eva if she want that photo and I take it but a woman appears from I don’t know where and asks us 40 Bahts because she owns these stands. Damn! We don’t have any special wish for that picture. We pay 50 Baht per person for admission ticket to the temple and go in. The visit is gentle and peacefully, as everything in this country. The stairs to get up are steeped and the views from the top are fantastic. The temple has that special thing of we haven’t seen anything similar in our lives. 3 Bahts later we’re back to Wat Pho, where we pay 30 Bahts each as admission fee and take our shoes off to see the huge Reclined Buddha which has an entire building for itself and spectacular nacre feet. Once with shoes again, we walk around inside the complex, between temples, small stupas and countless golden Buddha statues. Just before the exit, on the opposite side of the entrance, there is the most popular Thai massage school where we try one of these authentic massages. We get a number at desk when paying 220 Bahts per person and wait for 10 minutes to be called for a 30 minutes massage. It hurts in some specific moments, but when you leave you feel repaired. At exit a man asked us for our tickets. It was strange for me nobody asked for them at entrance, but doing it at exit is unusual as well. That man explains our tickets are also valid for visiting the temple with the fat Buddha in another area of Bangkok. I tell him I already know about it but we’re now going to visit Grand Palace. He answers it is closed until 3 PM, so his recommendation is taking a tuk tuk by only 20 Baht to the fat Buddha and then coming back on time for the Grand Palace. I had read before about the touts telling Grad Palace is closed for getting tourists to a tuk tuk which will take them to several shops where they have a commission. So knowing who we’re dealing with I state we’re going to go to Grand Palace now, he then reacts angry saying “It is closed! I’m telling you!”. Then I answer him I’ve got contacts inside and we’re going to be able of getting in now. He looks at me as if I was crazy and I left smiling. Grand Palace is really close to it: the next building, but we walk all along the walls looking for the entrance, which finally is in the side of the river. All the locals we meet in this way are shouting to us that it is closed. Even my wife has doubts about it stating that if everybody is saying the same may be true. Even when we can see the entrance and people coming in are still touts yelling that it is closed to the tourists. They’re really crazy about sealing us a tuk tuk ride. I just take a picture at one at road and it crosses all the lanes to come to me. I just keep doing denial gestures. The picture is finally the one above. Once with the tickets, Eva cannot understand how a whole city can get in agreement to tell the same lie to tourist. We've paid 350 Bahts each for the tickets and it is a big piece of paper composed by several tickets to different places. The complex is spectacular and has dozens of things to see inside: the palace, with its unmoving guards, the temple of the emerald Buddha, the golden chedi, a big model of Ang Kor Wat, which makes us to smile with recent memories, and a bunch of other temples, all shine bright. The idea is lunching in Khao San Road, which is close, but not with my way as, following my map and asking to several people in the street, we reach it after a long walk. At least, we could see the Democracy monument and the Giant Swing, which shocked me as, looking at the map, I cannot explain how have we get these places. Anyway, we finally reach the street and my wife is starving. I’m still fine after the big breakfast of this morning. It’s easy knowing you are in Khao San Road as the streets around are quiet, lonely, while there is a fixed market here and a lot of people, mainly tourists. We get into the first restaurant. Its name is “Tapas bar”, which recalls us to Spain, but they don’t know what “tapas” really are here. Eva eats a big plate of gnocchi and I’m fine with some grilled prawns. There is a seller of bamboo parasols by the street and he sells one to the group in the restaurant’s terrace which seems to me from the distance to understand it is by 200 Baht. My wife wants one of them and I call him to come to us, which means for him to ask for permission to the staff. Once in our table he writes 2000 in his calculator. “Is this right?”, I ask, and it seems it is. I expected from him to ask us more because we’ve called him and that means we’re interested, but this is ridiculous. Something I’m learning about bargaining is you can get incredible deals for things that you don’t want, but if you want something, then you’re going to pay more for it. I tell him I’ve just seen how he has sold one outside by 200 Baht, but he denies it. We finally purchase it by 500 Baht and he is so happy that wants to sell more of them to us, but we don’t need more. When he leaves, the boy that is serving us asks if we thing that has been a good buy as we’ve paid around 10€. Eva answers that, as it is handmade and painted, it is a lot more expensive in Barcelona. The boy explains his mother make them and gives us the idea we’ve paid overpriced. After lunching we walk along the street, through the market and do some shopping. Then we go to the parallel street looking for the football shirts. They’re everywhere, but I’ve read about a specific and small place where the replicas are perfect. When I find it, in the middle of the street as it is not a shop, I can say they’re really perfect and I can bring a Barcelona’s shirt by 340 Bahts. When we’re back on the market looking for the quickest way to leave and get a taxi, we meet the parasol seller again, who offers one by 300 Baht. For the same item! Taxis are cheap if you insist on using taximeter, and we take a couple of fruitshakes just before being resting in our room. We schedule a taxi for tomorrow morning at 5 AM to the airport as our flight time is 7 AM. We now have the task of splitting our stuff on two bags as one is going to be kept here and the other one will travel with us tomorrow. But I still want to do one more thing today: purchasing some sandals I’ve seen in our way from the Skytrain stop to the hotel, which can be used for water, thought for the elephants activity. As I don’t want to get into a long bargain I leave all my cards and cash at room except for 300 Baht. This way I’m sure I’m not going to pay more than that. With this I learnt the indications about getting half the price or so are outdated, they already know and can inflate prices a lot more than that. You only know the bargain is good when the seller is not happy, if he or she is it means you could do it better. I’m going to my hotel’s room thinking about this and recalling all the happy sellers we’ve left behind.